Evaristo returned to the Toronto Winterfolk Festival, bringing the exciting rhythms of the Cuban folk tradition! The show featured the folk music of Cuba: Cuban Son, Trova and other traditional songs, as well as Evaristo's own original music. In the spring of 2017, Evaristo returned to Lula Lounge with his all-star trio. A true Trovador, Evaristo's lyrics celebrate the personalities of his city of Havana, his love for the island, and his hope for the future. The show also featured Evaristo's modern interpretations of familiar songs from the Cuban Trova songbook. Evaristo had the opportunity to play his music for an enthusiastic New York audience in November 2015 at the Frost Theatre of the Arts in Brooklyn. Brooklyn has become home to many artists, and the Frost Theatre is committed to promoting Latin art and culture in the area. The show was part of a series dedicated to Trova music organized by fellow Cuban Roberto Poveda, and allowed Evaristo to showcase his own unique brand of modern and classic Trova, mixed with rock, pop and urban. During the excitement of the Pan-Am Games in the summer of 2015, Evaristo performed with Cuban icon Rojitas at Union Station. Every Wednesday at noon in July, the two singers entertained the lunchtime crowds as part of the 'Union Summer' event. The duo performed some of Evaristo's own songs as well as traditional Cuban music. Evaristo and his trio performed his own original songs, as well as Cuban traditional music, as part of this festival of music from around the world, benefitting the Sharing Place Food Bank. The festival was held at the Stephen Leacock Museum Grounds in Orillia. Evaristo and his quartet performed his new music, combining Cuban rhythms with pop rock and urban, at the 2014 Barcardi Festival Libre in Toronto's historic Distillery District. The songs are from his album, ‘Siempre Que Llueve…’ (After the Rain), as well as tunes from his upcoming project, coming soon. The Barcardi Festival Libre was a three day cultural experience celebrating rum cocktail culture with Cuban music, dance and art. Evaristo and his trio performed live on the CBC's 'Sounds of the Season' special, a fundraiser for local food banks. Evaristo played 'Tumbao Con Fe', CBC Radio's 'Here and Now' song of the week in November, as well a Cuban rendition of the holiday classic 'Silent Night'. Evaristo was interviewed live on the air by host Gill Deacon, talking about Christmas in his native land. Other performers in the show included Serena Ryder, Amanda Martinez and astronaut Chris Hadfield. Evaristo's original tune, "Tumbao Con Fe (Tumbao With Hope)" was picked as the Song of the Week on CBC Radio One's 'Here and Now' for November 11, 2013. Evaristo was interviewed on air, and they presented his song as a warm-up for the upcoming 'Songs of the Season' charity show on December 6. Evaristo will perform at the show, which will be broadcast on CBC television at 5:30PM. Check out our multi-media page for the video filmed in Havana. Evaristo took his unique style of modern and classic Cuban Trova to Latinada on June 25 as part of the 2013 Toronto Jazz Festival. Evaristo, with special guest Luisito Obregoso, performed both his own original material, Trova mixed with pop and urban, and songs from the Cuban Trovador tradition. Evaristo brought his solo act to the Art Gallery of Hamilton's ANNEX Unplugged, 'an innovative series of acoustic world music performances' in October, 2012. Evaristo's solo guitar performance featured his original songs in the Cuban Trova style, mixed with influences of pop and urban, and collaborated with jazz musician Louis Simão. Evaristo celebrated the release of his independently produced recording, 'Siempre Que Llueve...' (After the Rain) on March 16, 2012, at Lula Lounge. The album showcases Evaristo's roots in Cuban Trova, a style for singer-songwriters who accompany themselves on the guitar. This is a collection of poetic songs that focus on the lyrics, both personal and political, drawn from his experiences in Italy, Canada and of course, his native Cuba, 'la isla rota'. Evaristo gathered an all-star band to present these songs, that layer the Trova style with rock, urban, reggae and Afro-Cuban rhythms. The album is available online through our Web site or on iTunes. Please see our Music page for more details. The Havana Cultura festival, known for lighting up Toronto with the rhythms and culture of Cuba, this year took over Ossington Village for a weekend of great music and performances. Evaristo was excited to perform at this year's event, bringing his own brand of Cuban Trova and Afro-Cuban music, both his own material and songs from the Cuban 'Trovador' tradition. Evaristo had the opportunity to perform his song ‘Siempre que llueve…’ (After the Rain), live at the Karl Marx Theatre in Havana at the 2009 ‘Lucas’ Video Awards. The show was recorded for broadcast on TV Cubana. Evaristo's video was nominated for six Lucas awards, and was awarded a trophy in the best 'Making Of' category. Click here for more information. Evaristo’s video for ‘Siempre que llueve…’ (After the Rain), featuring Telmary Diaz, has been nominated for six of Cuba’s famous ‘Lucas’ Awards, for both Best Video of the Year and Best Music Fusion Video, as well Best Director, Best Art Direction, Best Director of Photography, and best 'Making Of' categories. Click here for more information. 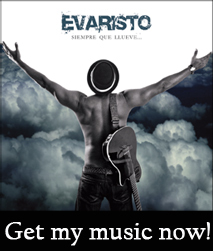 Evaristo has been nominated in the ‘Best Jazz’ category in the 2008 Ontario Independent Music Awards. The second annual Ontario Independent Music Awards will be held on October 16 at the Phoenix Concert Theatre in Toronto. Evaristo appeared on the CBC Radio program ‘Big City, Small World’ with Garvia Bailey this past January. Garvia interviewed Evaristo about his music and career, and he performed a couple of songs from his new project live in the CBC studio. Evaristo’s new song ‘Siempre Que Llueve (After the Rain)’ was one of three finalists in the 2007 John Lennon Songwriting Contest, Latin category. ‘Siempre Que Llueve’ is the title track for Evaristo’s new project, which he is currently working on in the studio. The John Lennon Songwriting Contest is an international songwriting contest open to amateur and professional songwriters who submit entries in any one of 12 categories, judged by a panel of artists and industry professionals. Click here to see the full list of finalists. Evaristo’s composition ‘Desamparado’ reached the semi-finals of the 2006 International Songwriting Competition, Latin category. The International Songwriting Competition (www.songwritingcompetition.com) is an annual song contest whose mission is to nurture the musical talent of songwriters at all levels and promote excellence in the art of songwriting. In 2007, Evaristo appeared in the Cuban episode of Street Eats on Sun TV. The show presented the Cuban restaurants and cuisine available in Toronto. Evaristo was featured in a solo performance from Mambo Lounge. Sun TV (Canada). April 2004: Evaristo's song ‘Luna del Barrio’ was selected by Opening Act, a national competition to choose 12 songs by unsigned artists to be featured on a compilation album (Opening Act is run by the Canadian Value of Music Coalition and the Harris Institute for the Arts).